Today the girls got their first taste of Positano with a walk from our villa to Eden Roc Hotel and back. The stop at the hotel was an excellent chance for a drink and to catch up with Carlo who manages the bar and restaurant. As always he had some great tips for places to eat in and around Positano although tomorrow evening we will be enjoying his hospitality with dinner on the terrace overlooking the bay. On the way back to the villa Jean and the girls posed for the classic Positano photo. 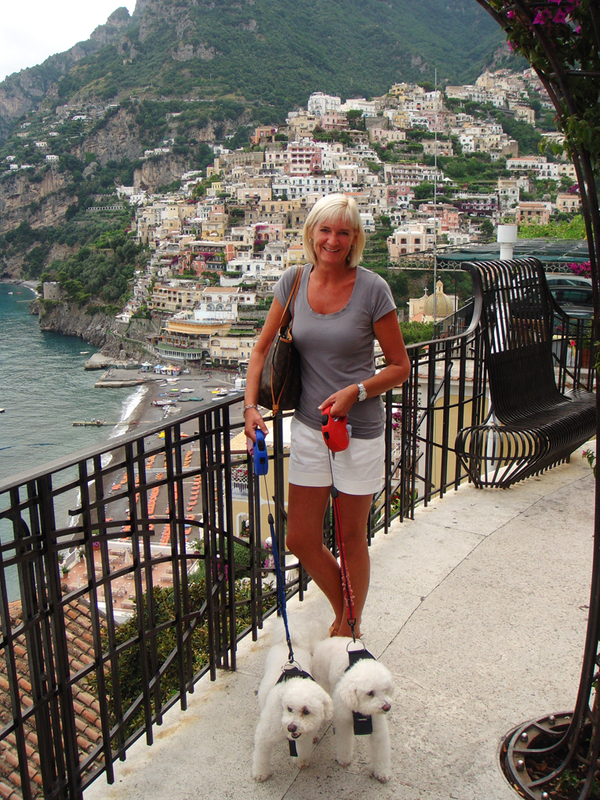 This entry was posted in Amalfi Coast, Italy, Positano, The Dogs and tagged bichon frise, Daisy, dogs, Holiday, Italian, Italy, Jean, Poppie, Positano, summer, villa, village by toscanakiwi. Bookmark the permalink. Jean, you look fabulous!!! Keep in touch!! !